Within the fruitful discussion about what design research should mean and achieve and the implication for doctoral education, this paper aims to explore the topic regarding the boundaries between project design research and academic design research. There is also a strong movement within the academic milieu in the realm of design, namely within international conferences and research meetings, to discuss methodologies and processes as a paramount contribution to defining scientific research in design. PhD design research in Portuguese universities started slowly in the late 1990s, but is increasingly establishing itself as a worthy degree. This text focuses on an original study depicting the state of the art of the methodological approaches applied in doctoral design research in Portugal. 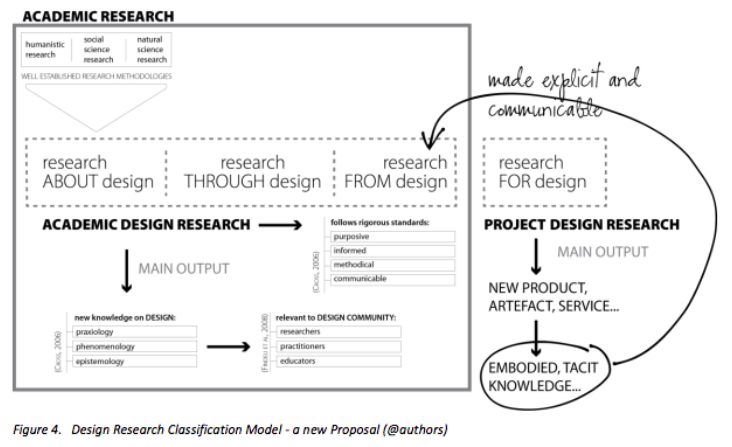 It proposes a Design Research Classification Model and a Design Research Canvas that can be applied to other systematic reviews of design research as a means of synthesising the past to outline the future. It is also a major objective of this work to contribute to a clarification of a methodological framework, which relates practice-based research to academic research.